Some may be surprised to hear that New Zealand has signed on to China's Belt and Road Initiative. This development project is usually associated in the public mind with impoverished and developing countries in regions like Africa, Central Asia, and the Middle East. So, why would a country, an ocean apart from China, with a Western level of development sign on? This dramatic move, with likely impact for decades to come, cannot merely be dismissed as a friendly gesture between Pacific "neighbors." Things become a bit clearer when we examine the nature of the project itself. The key word in understanding the Belt and Road Initiative is "Infrastructure." This is necessary for any economy to function, no matter what model or blueprint is being followed. In order for factories to produce, it is necessary to have functional roads and railways to deliver raw materials. Without sufficient power, even a country with vast natural resources will remain in darkness. No matter how healthy or intelligent a population is, an educational system is still required for its youth, and medical facilities must be available for those who become ill or injured. Up until the Second World War, and even up into the 1960s, it was the basic consensus among almost all economists that the State had a duty to maintain a country's infrastructure, allowing the economy to flourish around it. Since that time, less credible economic theories under the banner of "Neoliberalism" have spread widely. Figures like Milton Friedman and Ayn Rand argued for a kind of "Utopian Capitalism," in which the State has a "hands off" attitude. These ideas were promoted by the Ford Foundation, the International Monetary Fund, and other important global voices. After the fall of the Soviet Union, policies based on excessive laissez-faire principles were enacted across Eastern Europe and Latin America, with painful results in many places. Neoliberal principles also took their toll within Western countries. Britain has now ceased to provide free university education in many parts of the country, requiring students to pay tuition as government spending is cut. In the United States, water treatment facilities and railroads suffer from lack of funding and maintenance, often endangering the public. Instead of "free market prosperity" promised by Neoliberal theoreticians, the results of these policies have largely been a significant drop in wages and living standards. Yet, New Zealand, unlike many countries, has not embraced Neoliberal principles. While the New Zealand economy follows the Western capitalist model, it has maintained social-democratic and Keynesian mechanisms and continued to utilize them for the good of the public. New Zealand has continued to guarantee healthcare as well as free tuition at the primary, secondary and tertiary levels of education. Furthermore, while many countries in the West are now talking about protectionism and the possibility of a "trade war" with China, New Zealand has expanded, not reduced, its ties to the world's second largest economy. The result has been good for New Zealanders. According to the World Factbook, published by the American Central Intelligence Agency, the average life expectancy in New Zealand is now over 81 years of age, nearly two years higher than in the United States. In his widely-circulated letter to the people of New Zealand, the Chinese Premier Li Keqiang quoted the country's beloved mountain climber, Sir Edmund Hilary, who once said, "It's not the mountain we conquer, but ourselves." Li's use of the quote hinted at the obvious fact that building a more prosperous world means not only more high-speed trains, power plants, bridges, and hospitals, but also a process of inner evolution. Creating peace and development will require that human beings learn to cooperate with each other in a more egalitarian and collective way. 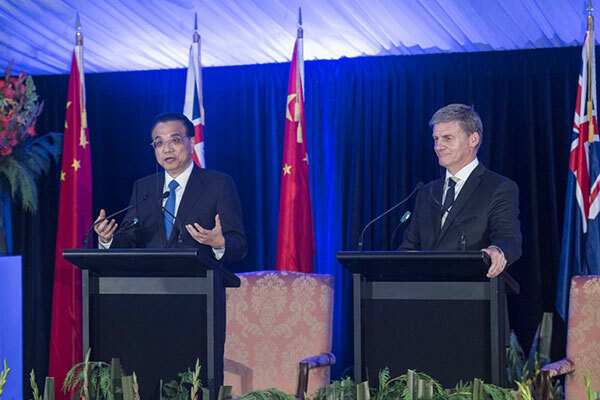 Despite vastly different historical trajectories, neither the leaders of New Zealand, nor the leaders of China have embraced what often appears to be the "prevailing wisdom" in Western countries. The two populations have rejected the belief that economies and societies should be organized around the principle of "every man for himself." Both China's population and the people of New Zealand feel the State and society overall should be directly involved in the process of raising living standards. Furthermore, the leaders of both countries recognize that development cannot be undertaken in isolation, and that cooperation between countries, on the basis of mutual respect and shared interests, is ideal for building a more prosperous world. New Zealand signing up for participation in China's Belt and Road Initiative may seem surprising on the surface, but it makes eminent sense.